On our tours, people who are usually rather talked ABOUT have their say. Our formerly homeless tour guides report about life without a roof over their heads. They present the public spaces and locations where they once lived. New Berliners and new Dresdeners who have fled Syria, Afghanistan and Iraq share their perspectives on their new hometowns. The tours through different districts and neighbourhoods offer room for dialogue and the opportunity to overcome reservations and reconsider one’s own prejudices. querstadtein e.V. is a non‐profit association. The association aims at promoting popular and professional education according to § 52 section 2 number 7 of the Tax Code. Download the statutes of the association as a PDF file here. querstadtein e.V. is a member of the Berlin association AK Wohnungsnot. During the first year and a half, querstadtein was established by a team of volunteers. Meanwhile, it has flourished into a small social enterprise with three permanent employees and 15 tour guides. Our founders Katharina Kühn and Sally Ollech observe the gulf between homeless people and mainstream society. They want to bring the two groups in contact. Their idea: formerly homeless people give tours through the streets that were once their home. The aim is to give first‐hand insights into the situation of those affected by homelessness, to reduce prejudices, to create a platform for encounters and to provide previously homeless people with an additional income. The two founders submit their concept to the competition startsocial, which supports social projects with economic know‐how, and begin to implement their project. querstadtein wins the startsocial scholarship which implies free advice and counselling. In March, 13 team members found the association Stadtsichten e.V. and launch cooperations with players such as the Berliner Stadtmission and the homeless magazine strassenfeger. The first tour starts in June with city guide Carsten Voss. He is later joined by Uwe Tobias. For this project, the team of volunteers is awarded the FES prize for social commitment. At the same time, the founders continue to develop querstadtein as a social enterprise: At the Social Impact Start Pitch, they win a free coaching and two places in the Social Impact Lab. At the end of the first year, querstadtein can look back upon some 3,000 participants. In March, the first full‐time position is created with funds of the Auerbach Foundation. At events discussing the problem of homelessness, the team contributes its expertise; querstadtein becomes a member of the AK Wohnungsnot, a Berlin‐based committee on housing problems. Dieter Bichler joins the city guides with a tour through the neighbourhood City‐West. The feedback of the tour participants increasingly shows us that querstadtein succeeds in changing their attitude and behaviour towards homeless people in everyday life. Together with Uwe Tobias, the team develops a city tour for children. In July, Klaus Seilwinder makes his tour debut. querstadtein is honoured by the Robert Bosch Foundation within the programme Die Verantwortlichen (The Responsibles). With Refugees show their Berlin, querstadtein establishes a second group of city guides. This wins them the scholarship ANKOMMER. Perspektive Deutschland (together with the Sharehaus Refugio). The office now moves to its new location in the Refugio. As of March, guided city tours are funded as a model project by the Federal Agency for Civic Education. 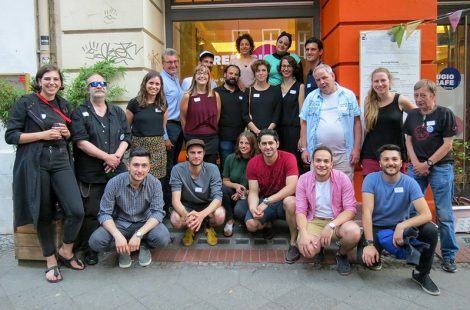 Samer Serawan, Arij Oudeh and Firas Zakri are the first tour guides from Syria to offer tours through Neukölln in English. They are soon joined by Ahmad Oudeh and Hamdi al Kasar. Nafee Kurdis’ tour through Berlin city centre starts in December. Mohamad Khalil now offers the tour through Neukölln in German. Wael Alafandi adds a refugee tour through Berlin city centre. Meanwhile, the office grows into a three‐person team. The founders hand over the baton to a new management team: In May, new board members Sandra Brandt, Andreas Schlamm and Marvin Wiek take up their post. In September, Selina Byfield joins querstadtein as Managing Director. The bpb funding continues for the third year running – a great opportunity to grow beyond the borders of Berlin: In late April, the project Refugees show their Dresden is launched. Furthermore, with the support of the Berliner Sparkasse Foundation we are able to organize 45 free homeless tours for school classes from Berlin. querstadtein is awarded Landmark in the Land of Ideas and shortlisted for the FARBENBEKENNEN‐Award initiated by the Senate Chancellery Berlin. In August the association’s name is officially changed to querstadtein e.V.